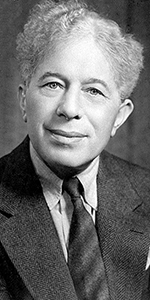 Sid Grauman, the man who created Hollywood's Chinese Theatre, was the movie business equivalent of Prince Charming. A natty dresser with supurb artistic sense, he made friends with almost every figure in Tinsletown, resulting in the very footprints we celebrate here. The Grauman family history is vague, but father David had an interest in mining. By the time Sid was 14, the family was in Colorado. While there, he was invited to attend a fancy party at the home of a well-to-do family. Sid was in a panic for the lack of suitable clothes to wear. Mother Rosa altered one of David's cast-off suits, creating a new suit for him to wear. It was at this party that Sid discovered his flair for arranging amusements. Young Sidney accompanied his father David to Dawson City in the Yukon to cash in on the Gold Rush there in 1896. 17 year-old Sid sold newspapers at 50 bucks each until a store owner bought a paper, then read it aloud to his customers, teaching Sid a valuable lesson: people will gladly pay to be entertained. David and Sid Grauman prospered in the Yukon by promoting boxing matches, and those new-fangled things motion pictures. A family crisis led David to leave, but Sid remained behind, learning and exploiting the entertainment business, finally re-uniting with father David and mother Rosa in San Francisco by 1900. The Grauman's opened the Unique Theatre, adding films to the vaudeville lineup. A second theatre was opened, called the Lyceum. The Grauman's became operators of an agency for vaudeville performers throughout the Pacific Northwest. The Grauman's lost their interest in the San Francisco theatres — just in time for the 1906 earthquake there — Sid salvaged a projector and some films, and set up a tent to show films in. The show must go on. When David Grauman passed away suddenly on April 6, 1921, Rosa took a suite adjoining Sid's at the Ambassador Hotel, where they lived in spendid harmony together as Sid opened his Egyptian Theatre in October, 1922. Grauman's Metropolitan Theatre (later to become the Paramount) followed in January, 1923, and, as we know, the Chinese in 1927. 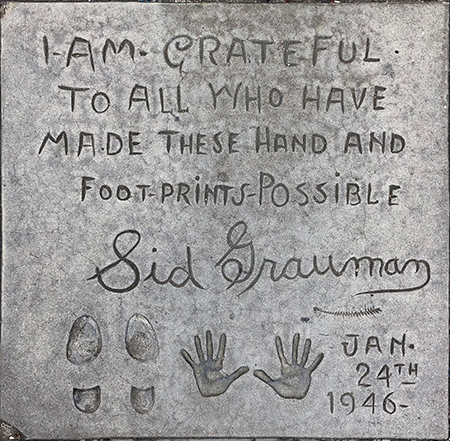 At that time, Sid Grauman became one of the founding members of the Academy of Motion Picture Arts and Sciences — the only exhibitor to ever hold a membership in this body — a testament to his standing in the film community. Many people believe that Sid Grauman was overextended when the Stock Market Crash in October, 1929 occured, and that he lost all of his money. This would have forced him to sell his interest in the Chinese Theatre to Fox West Coast Theatres, but we believe that this is not correct. Grauman's Chinese was officially controlled by FWCT from mid-June, 1929. Therefore Sid had sold his interest in the theatre at exactly the right time to get out. Part of Sid's deal with FWCT was that he was to remain as the theatre's director, which would allow him to continue to stage his famous Prologues. Sid may still have been wiped out in the Crash, but afterwards, he clashed often with FWCT management, threatening to go into film production, which is not the boast of someone who is broke. Eventually, the economics of producing the Grauman Prologues no longer worked, and Grauman had to content himself with managing the Chinese Theatre and adding to its collection of Forecourt imprintings. This remains a high honor for all who join the parade of famous names to be found there. Living in the epicenter of U.S. film production, Sid was invited to play himself in a number of films; we have here a complete rundown: He appeared as himself in Hollywood (released in August, 1923); he played an extra in Charles Chaplin's The Gold Rush (a project Sid Grauman had much to do with influencing his great friend Chaplin to make, and which had its World Premiere at Grauman's Egyptian Theatre in June, 1925); and Screen Snapshots (a short released in May, 1926). Sid Grauman was caricatured in the Walt Disney cartoon Mickey's Gala Premiere (which played along with Dinner at Eight at the Chinese in August, 1933). Sid had a bit part as a poker player in Call of the Wild (which played the Chinese in July, 1935), which has a Gold Rush setting, and played himself in Hollywood Hotel (released in January, 1938), and did the same in Mad About Music (released in February, 1938), and Star Dust (which played the Chinese in April, 1940). Sid Grauman did his own Forecourt block with his good friend Gene Tierney, currently starring in the mega-hit Leave Her to Heaven, which was playing at the Chinese at the time of the Forecourt ceremony; Tierney left her footprints there that same day. Finally, Sid appears in the following short subjects: Week End in Hollywood (released in 1947), Screen Snapshots: The Great Showman (released in January, 1950), and Screen Snapshots: Hollywood's Famous Feet (released in July, 1950). Rosa passed away in 1936, with Sid refusing to sell any of her posessions. Sid himself passed away of a coronary occlusion at Cedars of Lebanon in East Hollywood on March 5, 1950 at the age of 70. Grauman's Chinese Theatre, Hollywood, California. Sid Grauman Forecourt ceremony, Thursday, January 24, 1946. 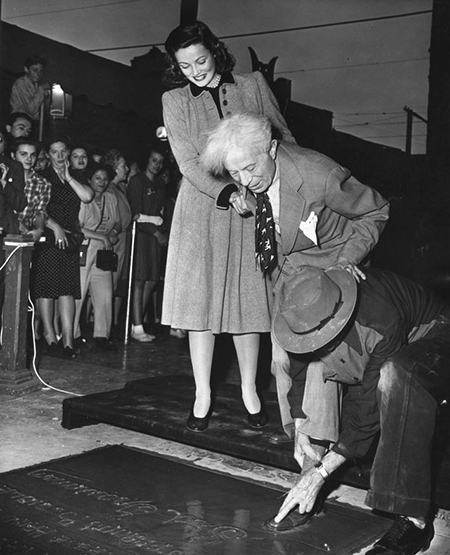 Gene Tierney helps steady Mr. Grauman as cement artist Jean Klossner makes an impression of his shoe.